“The commencement of our operations in Colombia is a definitive leap into the next level of our global foray. Having already spread our footprint to 19 countries across Asia, Africa and South and Central America, we are fast setting up a network of manufacturing facilities across continents to cater to the existing and newer markets. Today, we laid the foundation stone of our manufacturing plant at Villa Rica in Colombia, the first full-fledged plant by an Indian two wheeler manufacturer in Latin America. Once operational towards the middle of Financial Year 2015-16, the plant will have an annual capacity of 78,000 units that will be scaled up to 150,000 units in the next 3-4 years. Through our fully-owned subsidiary in Colombia – HMCL Colombia SAS – we will be investing US$70 million in the country. Mr. Pawan Munjal, Managing Director & Chief Executive Officer, Hero MotoCorp Ltd. In keeping with its vision of expanding its global footprint to as many as 50 countries by 2020, Hero MotoCorp Ltd (HMCL), the world’s largest two-wheeler manufacturer, today marked yet another significant milestone in its journey to global expansion–the formation of its wholly-owned subsidiary in Colombia and the commencement of a state-of-the-art manufacturing plant in the country. 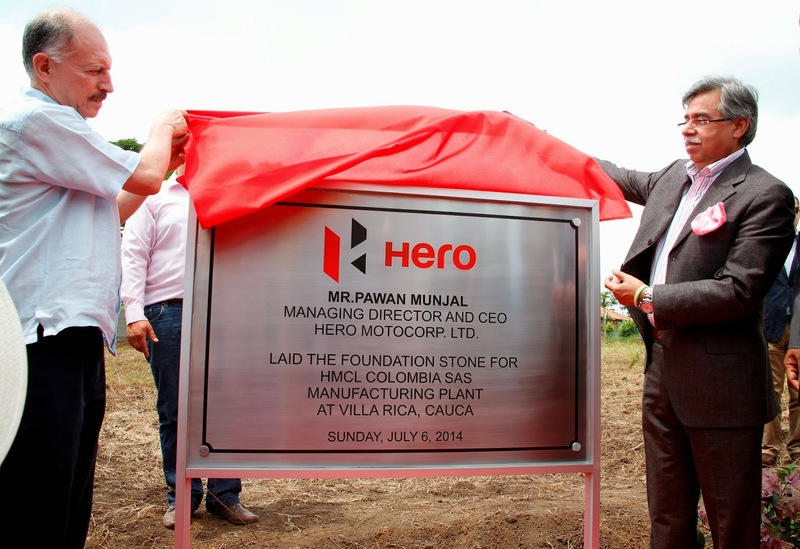 The foundation-stone was today laid by Mr. Pawan Munjal, Managing Director & Chief Executive Officer, Hero MotoCorp Ltd, at the project site today. Also present on the occasion were senior representatives of the Colombian government, the Senior Leadership Team from Hero MotoCorp and other associates. With a project cost of US$ 70 million, HMCL will invest US$ 38 million in CAPEX, with the rest being utilised as working capital over the next three-year period. The equity investment will be made through HMCL’s wholly-owned subsidiary in the Netherlands –HMCL BV. The state-of-the-art manufacturing plant - spread over 17 acres (68,000 sq meters) of land at the Parque Sur Free Trade Zone at Villa Rica in the state of Cauca - about 500 km south-west of Bogota - is expected to go on stream by the middle of calendar year 2015 with an initial installed capacity of 78,000 units. This will go up to around 150,000 units in the second phase. With this, the New Delhi-headquartered Hero MotoCorp will be the first Indian two-wheeler company to have a manufacturing plant in Latin America. Hero MotoCorp – since charting its solo journey after separating from erstwhile partner Honda in 2011 - has fast augmented its global presence. As of today, Hero two-wheelers already sell in as many as 19 countries including Peru and Ecuador in South America; Guatemala, Honduras, El Salvador and Nicaragua in Central America; Kenya, Mozambique, Tanzania and Uganda in East Africa; Burkina Faso, Ivory Coast, Congo and Angola in West Africa and Turkey, Egypt, Sri Lanka, Bangladesh and Nepal in Asia. In partnership with its local distributors, Hero has also established assembly units in Kenya, Tanzania and Uganda in East Africa. With two more new plants coming up – the one in Colombia, and the other in Bangladesh through a joint venture – the company is fast building up a global manufacturing base to cater to its growing international markets. Hero MotoCorp sold a record 6.25 million two-wheelers in the Financial Year 2013-14 – the highest-ever by any single two-wheeler manufacturer in a financial year. HMCL has multiple global technology alliances with internationally-renowned design and technology firms. Hero MotoCorp is also in the process of building an integrated state-of-the-art Centre of Global Innovation and Research & Design in India. 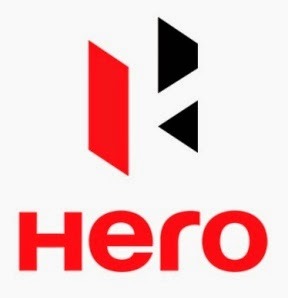 Hero recently became the first Indian two-wheeler company to reach the historic milestone of 50 million units production. By the year 2020, the company aims to cross 100 million units in cumulative production, and annual bike and scooter sales of 12 million units. It also plans to have more than 20 manufacturing and assembly plants across the globe with sales in more than 50 countries by that year.